Still looking for Valentine’s ideas in Lafayette? Don’t worry, we’ve got you covered! At Acadiana Courier Tux & Limo, we have an impressive fleet of limousines and party buses that are sure to impress your date or group. 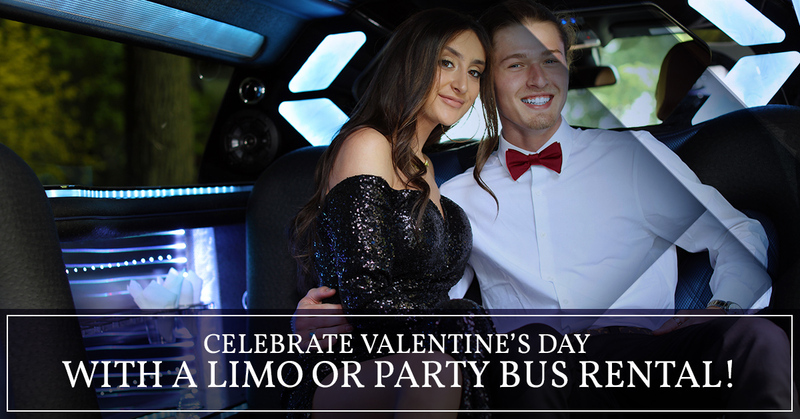 Make a vehicle reservation with us today, or continue reading for some reasons why renting a party bus or limo is the best way to celebrate Valentine’s Day! The season of love is all about treating yourself and showing your loved ones how much you care. If you’re planning a date night or a fun night out with your best friends this Valentine’s Day, take your plans to the next level by traveling to and from your destination in a party bus or limousine. When you choose Acadiana Courier for your limo or party bus rental, you get exceptional service all the way. After all, that’s the point of being chauffeured around town! Whether you’re going out on a date with your special someone or you’re hitting the town with your friends, you’ll want to arrive in style. Start the celebration early with a champagne toast, and party the night away on your ride home. Depending on which limo or party bus rental you choose, your party will get to enjoy disco ceilings with a light show, flat-screen TVs, speakers with Bluetooth/AUX connections, a wet mini bar, and so much more. Let’s get this party started! If being chauffeured around town while sipping champagne in a luxury vehicle isn’t enough reason to rent a party bus or limousine this Valentine’s Day, then do it to make memories with your loved ones. It isn’t every day that you get to ride in a party limo or dance with your friends in a party bus under strobe lights, so treat yourself to a night you won’t forget. Trust us, we’ll make it worth your while! If you’re looking for last-minute Valentine’s Day ideas in Lafayette, sit back and let us do the work for you! Rent a party bus or limo for your party today, and we’ll transport you to and from your destination while you celebrate with your friends in style. Check out our fleet of luxury limousines and party buses online, and make your reservation with us today. If you have questions about our party bus prices, feel free to give us a call anytime. We look forward to being part of your special night!